A jury trial has been scheduled for January for a Minidoka man accused of battering his wife and threatening her with a gun last May in southern Blaine County. 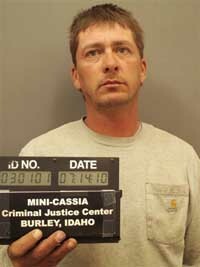 Charles Lester Strate, 38, was arraigned Friday in Blaine County 5th District Court on a felony charge of domestic battery resulting in traumatic injury. He is also charged with the misdemeanor crimes of exhibition of a deadly weapon and intentional destruction of a telecommunications instrument. Strate is represented by Ketchum attorney Andrew Parnes. He pleaded not guilty to all three charges. The case was investigated by the Blaine County Sheriff's Office with assistance from the Minidoka County Sheriff's Office. The crimes allegedly occurred at Strate's home, which according to police reports is in the southern arm of Blaine County about six miles east of the city of Minidoka. Strate was arrested July 14 and booked into the Mini-Cassia Criminal Justice Center in Burley. He posted $15,000 bond that same day and was released. A probable-cause affidavit filed by Blaine County Sgt. Brad Gelskey alleges that the incident occurred May 22 when Strate "shoved and grabbed his wife, forcing her to fall down and strike her head on the toilet of the bathroom, causing serious injury and swelling to her left eye and left side of her face." Gelskey also alleged that Strate broke his wife's cell phone, "preventing her from calling for help," and fired a gun "into the living room floor making the statement that he was ready to finish this tonight." A statement by the wife is attached to the Gelskey report. In the statement, the woman wrote that violence erupted when the couple was arguing about her daughter, her ex-husband and her ex-husband's family. The woman initially reported the incident to the Minidoka County Sheriff's Office, which relayed the information to Blaine County. Strate's trial is scheduled to start Jan. 5 with Judge Robert J. Elgee presiding. The trial is expected to last two days.